Innovative Eye Care has recently taken on a new eyewear collection that might just be the most original eyewear brand we stock. Designed by a Mr Roger Hoppenbrouwers (say that five times fast), when we first laid eyes on the frame models we almost couldn’t believe what we were seeing. CAPTION: Roger frames Cartoon Isodoor (left), Andras (middle) and Cartoon Pedro (right). Roger Eye Design loves creating eyewear with a surrealist touch. They resemble glasses a cartoon character might wear by creating definition where there normally is none. In doing so, these frames make you do a double take. It creates a very specific sort of optical illusion, something that we have seen in both art and fashion. A specific designer who has looked at this in recent years is Iris Van Herpen. In a Vogue US article titled Spring 2019 Couture: Iris Van Herpen, the writer mused that the designer’s most recent collection was ‘Picasso-esque’. We’re used to seeing joined components like facial features or individual ripples on silk as distinct and separate, when in reality they blend together as part of a whole. So when an artist or designer starts really splitting these components up, like Picasso painted blunt lines onto a face, or Iris Van Herpen sews physical segments to resemble those folds on a piece of material, it shocks the eye. 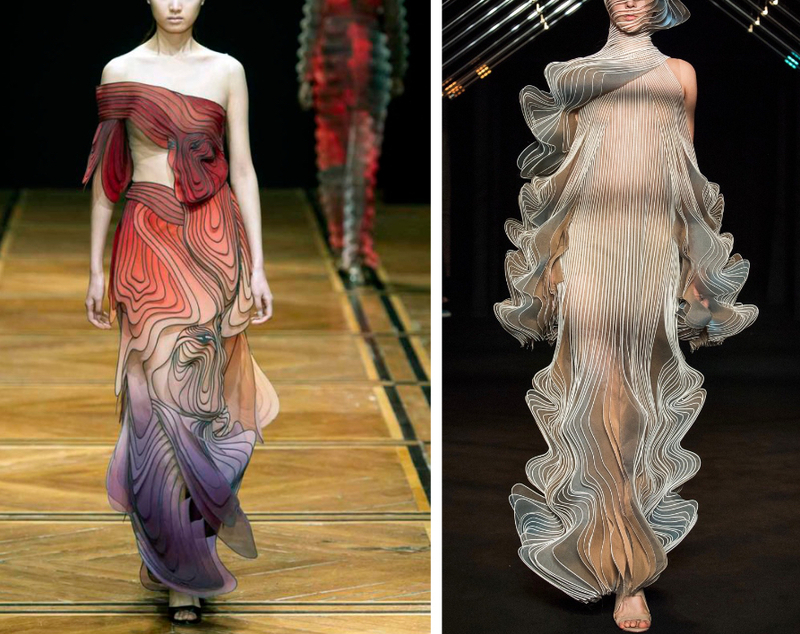 CAPTION: Iris Van Herpen Couture pieces from S/S 2019 (left) and F/W 2018 (right). Picasso, Iris Van Herpen and Roger Eye Design use this technique to create pieces that have the intent of catching you by surprise. The artists use something as simple as defining the undefined, be it on canvases, dresses or frames, for unique and incredible styles. Roger eyewear is perfect for someone who loves to challenge the norm and push boundaries. They’re suitable mostly for short-sighted people and progressive lens wearers. If you’re interested in looking at our Roger Eye Design collection, come in to our Hutt Street practice, or peruse the Roger Eye Design catalogue here.